Most iPhone and iPad users will want to enable the pop-up blocker in Safari for iOS in order to prevent annoying popups and nuisances, but sometimes the built-in Safari pop-up blocker is overly aggressive and wrongfully blocks a popup on a site where pop-up usage is required for the site to work as intended. 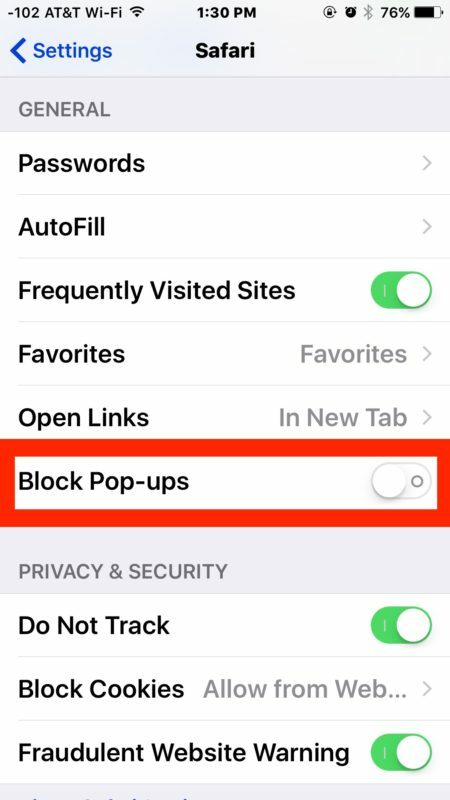 For those situations, users can choose to disable the pop-up blockers in Safari for iOS easily, and it’s just as easy to toggle the feature back on again too. This may go without saying, but unless you have a specific reason to disable the pop-up blocker in Safari for iOS you will probably want to leave the feature enabled (or turn it on if it is currently disabled). It’s pretty obvious when a popup blocker is preventing the proper usage of a website, so it’s not really a Safari troubleshooting trick and there isn’t much of a mystery involved when popup prevention is interfering with a sites functionality. It’s also a good idea to re-enable the popup blocker in Safari for iOS after you are done using whatever site required it, so that you can prevent the more annoying type of popups from showing up in the future. You don’t need to reboot or relaunch Safari, simply toggling the switch off or on will have an immediate impact on whether or not websites and webpages in Safari can open a new pop-up window in Safari on an iPhone, iPad, or iPod touch. Keep in mind that pop-ups are almost always opened in Safari will open as a new tab, meaning they can be accessed from the tab viewer, which looks like two overlapping squares. As mentioned, most users will want to leave the pop-up blocker enabled in iOS Safari. But sometimes turning it off is a necessity. Typically such a situation occurs on some financial websites and login services, often where a temporary pop-up will appear as a pass through, or to display some type of relevant information like a PDF, a report, or authentication details. Of course if you have the pop-up blocker enabled when you try to use one of those types of sites on an iPhone or iPad, the website will usually just fail to work properly and you won’t see the data requested. Perhaps a future version of Safari for iOS will allow individual websites to open pop-ups as needed, like what is possible with Google Chrome on the desktop, but in the meantime you can control the pop-up blocker and toggle it off and on again easily through iOS Settings on a Safari-wide browsing experience. This is obviously relevant to iPhone and iPad with Safari, but Safari for Mac also can allow pop-up windows if needed there as well. I have to turn this off when using the health insurance website which is like from 1992 and pops up documents and other details. Hold the refresh button and reload without adblock. thanks for the tip, didn’t know that! MSN articles I try to post a comment pops up a block message to open up facebook shows, “This site is attempting to pop-up a window.” I went into Safari settings and disabled block pop-up, but it still has the same message. I then had facebook app signed in and website signed in on iPad and same block message. Had refresh article page and same thing.